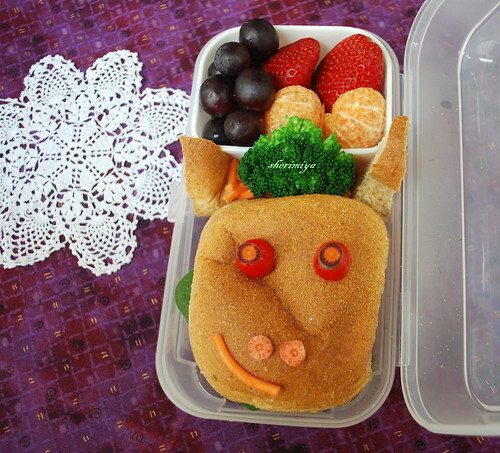 Horse Sandwich Bento, originally uploaded by sherimiya ♥. I sometimes don't bother posting the Monday bento because I am usually running late and the rushed bento doesn't look pretty...but this time I am posting it. It's a simple one; a quick and easy sandwich on a fluffy wheat bun. I fried some ham and an egg, melted cheese on top, and added a few baby spinach leaves. This sandwich bento box is a perfect size for it. A few details turned it into a horse: broccoli mane, grape tomato and purple carrot eyes, maroon carrot nose, and a carrot smile. In the side box I gave him some red grapes, juicy strawberries and a mini mandarin. That's it! That's all I have time and energy for; and when I closed the box, the facial details smooshed down to stay in place. Yay! haha, this one is hysterical AND adorable! i'm still loving this new-ish box (the same one you used for bahn mi, right? ), and the little details that turn this meal into a horse are sooooo clever! Tee hee ...so cute! I believe this is the first horse I've ever seen in a bento. Brava! Thanks Debra! Though I have to admit, my boy took one look and said, "what did you make? a bear?" Cute horse with an adorable expression...love that even when you are rushed you make the effort to put charm and sweetness in your bentos! please visit my Give Peas A Chance blog to claim your award! great blog!! thanks for the crunchy bread tips with Bob's grains! Thanks bentobird, that's so sweet of you! Natesgirl, thanks soo much!! I'm so flattered to receive this award from you!! Hi Rachel, You're welcome! Hope you thought of something cool to do with your coconut water!